First off, off I’d like to thank everyone who entered to win 9,000 of my Club Carlson points; I really enjoyed reading all of your best points-redemption stories! Thanks to all who liked the Facebook fan page, tweeted at me, and subscribed – I’m grateful for all of your support. Without further delay, let’s get straight to the winner, shall we? 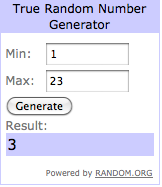 Using random.org, the lucky number that was generated was 3, making commenter Hans Mast the winner! Congratulations! Hans, please send me a private email with your full name and Club Carlson number no later than Monday, February 6, 2012. As soon as I receive your account information, I’ll go ahead and transfer your prize to you. LOL Franklin, your comment won my heart & made me smile :). I'm actually in Stamford working on a set today! Thanks for your nice words about the blog! !